As I have passed 100 posts on Ello, I was thinking to myself, what are the attractiveness of social media? A simple answer that I could come up is...it is simple. It makes someone voice on the net be heard. I used to have Twitter accounts...yes Twitter accounts. I have about 20 accounts I think. There was a software that I was using to follow people and if they don't follow me back within 3 days the software un-follow that particular person. So the game was how many followers you can get. I am using Facebook and have a fanpage as well. Most of my friends are on Facebook and basically it's okay that the quality of the post is not great. But they your friends so it's alright. To catch up on what's they doing, I simply quickly browse through the posts. Don't know how the algorithm work on Facebook and the advertisement? It's part of life and you simply cannot get away from it unless you pay. As for Instagram? I don't get it. Google+ is a great viewing platform to showcase my work. You get tonnes of views for your photos. And some of your post could be search engine optimised, especially on Google search engine. Make Google your friends. For Ello, I've heard from @thomashawk while watching TWIP. I see great artists in here that is on the same boat as I am. They want somewhere on the net where they could have a voice and Ello and other social network makes it so simple that they have forgotten to do it for themselves. Ello is still in Beta and invites only to get into the social network. They are fine-tune the technical challenges and makes the social network more enjoyable for the members. But as a business person myself, the Venture Capitalist (VC) will want to ask themselves. When can I get my return on investment (ROI)? What business model is Ello based on? From what I have read online, they want to copy iTune or Ebay business model. Pay to upgrade for extra features or services. What's make Ello unique? Or is it unique at all? The anti-Facebook, no advertisement and community based is "cute" and simply a marketing gimmick. The early creator of Ello had a noble idea but I can't see myself paying extra features that I can get elsewhere virtually free. The attractions of social media is the instant feedback you get back after a post. An immediate reward either positive or negative, your voice is answered. What could Ello do and still remains viable business model? I have done some random research on some of the people active right now on Ello. What I've noticed is about 50% or more don't have a personal website. They have other social networks like Google+, Facebook and Twitter account but a personal website...NO. Why is that? The answer is simple, it is easy to have an on-line presents immediately and a community to response to your voices or audiences. Either with friends on Facebook, total strangers on Twitter or Google+. The backlash from Facebook is not your post is not seen by friends and family. The online voice is restricted by "Big Brother", unless you pay "Big Brother Facie" ofcourse. In business we have to talk about exchange of value, what values does social media brings to the table? TRAFFIC either by pay advertisement to drive traffic to sites for other exchange of values, goods or services or ideas. Ello is not and never allow advertisement on the site? The critics are out pointing to this facts. How else will they survive and grow? They can't rely on a few merchandise sales to fund the growth, there must be a long term solutions. 500px business models for photographs but apply to text, photos,graphics etc. Let me explain myself, currently on 500px, photographers can upload as many photo as they want and they basically can select which photos to be in their portfolio on a personal website, with domain attach, and it instantly go online. Any changes to it can be done instantly. What's stop Ello and all the posts to have the same characteristics? People want to own a personal website, a virtual land on the world wide web. Who ever can make it easiest and pain free own the markets. There's online click and drag website builder like Wiz and SquareSpace but they lack the community aspect to it. You want to have a dynamic website that constantly growing and also constantly indexed in search engines. I personally want my work to be discovered by other people outside social network. And I'm sure other artists on Ello feel the same. Ello never allow advertisement on Ello website, but I want to have an option to monetized my effort on my personal website host/DNA/engineer by Ello. For adds on, like shopping cart and email list, I am willing to pay for it and it certainly provide great values to me. 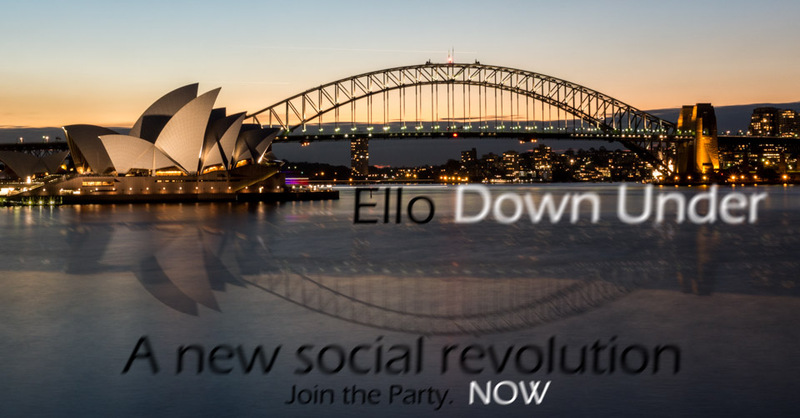 Right now Ello is in a great place to make great changes to social network. With a great brand awareness but lack directions in my opinion. Ello don't want to be a anti-Facebook but a leading content provider for the people. A voice if you prefer for the information age. Only then Ello can find the right niche and serves some values to the people. Otherwise it is just another "cute" friend or social network that I find online.